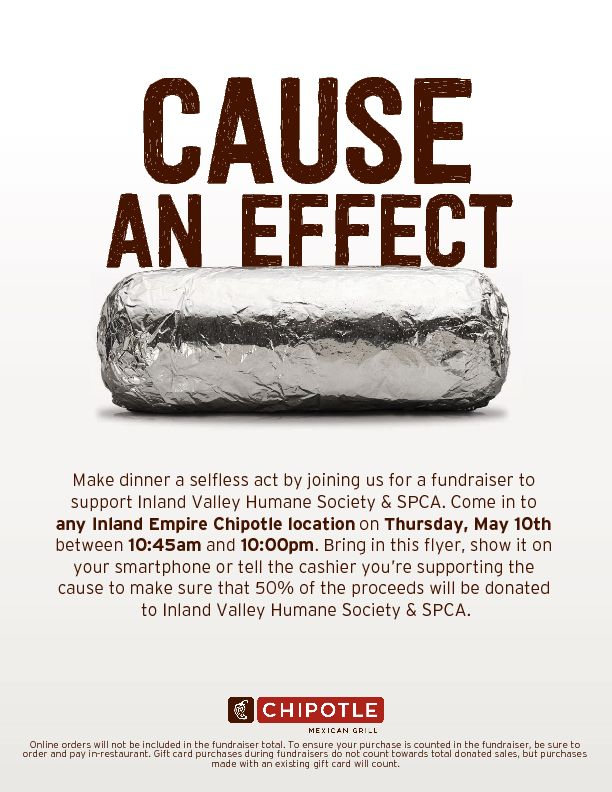 You can help out the Inland Valley Humane Society and SPCA Thursday (May 10), simply by eating at Chipotle Mexican Grill. The chain is donating 50% of fundraiser sales that day to the organization. All you have to do to help is dine at a participating Chipotle between 10:45 a.m. and 10 p.m. Thursday and either give them a copy of this flier (shown above), show it on your mobile device, or simply mention the fundraiser to the cashier when you pay. Participating locations include Chino, Chino Hills, Upland, Corona, Mira Loma, Montclair, Moreno Valley, Redlands, Norco, Corona, Rialto, Rancho Cucamonga, Riverside, Perris, San Bernardino, Banning, Hesperia, Victorville, Fontana and Ontario. For more information, including a map of participating locations, click here.